BRIDGE NORTON - British Railways in mid-seventies corporate blue. The "TATs" were a personal favourite. this Just Like The Real Thing model is a regular performer on Bridge Norton. Ian's first attempt at the Class 52 from a JLTRT kit. D1011 Western Thunderer with super-detailing to the bogies. Stabling point on Longroyd Bridge, another great layout by the Huddersfield Railway Modellers. Derek Shore's cover Picture for the September 2013 Railway Modeller magazine. One of the last in green..... 47366 displays a blue data panel in this depiction of a 1976 scene on Bridge Norton. D1054 takes the clays on the elevated line. Preparing the milks on Lydgate, a display layout by Huddersfield Railway Modellers. Steve Speck's lovely model of 811 Daring along with D1054 at a Western Legacy meeting in Peterborough. A further couple of Derek Shore's lovely pictures on Bridge Norton. 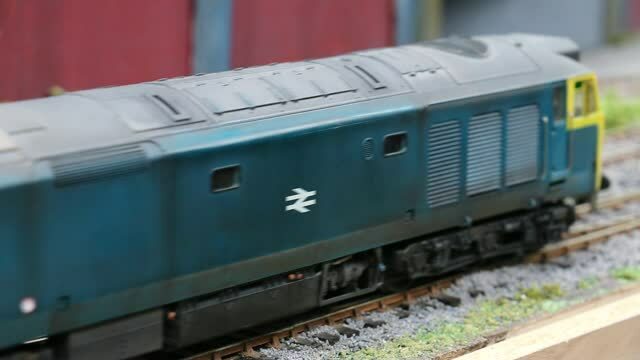 Ian Allcroft and Dave Oliver give their insight into the background, rapid build, and exhibition of a DCC participative O Gauge layout by the Huddersfield Railway Modellers and operated in conjunction with the Western Locomotive Association. There’s a small railway station a few miles North of Stafford and a few more South of Crewe. It still exists today, now in decline, but a place we loved to cycle to, just to “Stop, Look and Listen” to the trains go by. Many of you may know this place well, as Norton Bridge station has regularly been photographed, cited and featured in the various railway circles in which we move. For me, Norton Bridge holds fond and vivid memories of the sights and, importantly, the sounds of the B.R. scene in the 1970’s and ‘80’s – a period dominated by the corporate blue livery, although still with a chance to catch that elusive locomotive still in green if you were lucky. Situated on a long, sweeping curve on the WCML, and with a fork off to the North-East to Stoke-on-Trent, Norton Bridge would deliver a multitude of locomotive classes on Inter-City, inter-regional and local passenger and freight services, often travelling at speed. Preceding these sights, of course, came the sounds! Being on the curve, the approaching trains were obscured from view, and we quickly became familiar with the distinctive sounds of most classes of engine whether approaching or receding. There’s no doubt about it, I’m a diesel fanatic. Whilst the screeching or roaring of a high speed A.C. electric might “cut-it” for some, for me, there was nothing like picking up the deep throbbing of an approaching TAT (*) on its train of heavy 100 ton oil tankers, or the “nippy brickie”, an almost daily London Brick Company train, affording a regular “after school” tea-time attraction with (almost invariably) a pair of hard working Cricklewood allocated Class 25’s thrashing their heavy train northwards. On a still day the “Rats” could be heard approaching from miles away as they re-applied power through Stafford station, having negotiated the sharp curve to the South. Whether it was 100 m.p.h. “leccies”, or chugging Class 24’s, the sounds were truly inspirational and have stayed with me ever since – so it is strange that it was the sound of a locomotive class which I never saw at Norton Bridge (back then anyway!) that was instrumental in the decisions taken to build what was to become “Bridge Norton”. My father had been nagged, cajoled, pestered, and begged for long enough to know my desire to see the remaining “Western”, Class 52, Diesel Hydraulics before they disappeared from service in the mid 70’s, and he had dutifully taken me along to Birmingham New Street and to Bescot on many occasions where we had spectacularly failed to observe a single member of the Class while suffering the frustrations of several “near misses”! It was at that time that a certain well known breakfast cereal manufacturer (Ed. That would be be Kelloggs then!) ran a special offer of free rail travel for accompanied passengers by collecting yellow tokens from their packets. I don’t think I ever ate so many cornflakes! Arrival of the resultant travel vouchers was met with a Dad’s promise of just one more Saturday trip to New Street and Bescot in the hope of finally “copping” a Western. In the event, we departed South from Stafford from Platform 1 which was most unusual for taking the right fork to Penridge, Wolverhampton and on to Birmingham, and I still hadn’t “twigged” something was afoot until we screamed through Tamworth Low Level. “We’re on the wrong train, Dad!”, I said. My dad just laughed at me and then I realised! We weren’t bound for Birmingham at all…. We were off to London, and to PADDINGTON! Apparently, there were tears of joy, but I don’t remember that (Ahem.). I was only 9 years old after all! Needless to say, it was a truly memorable day. I was amazed by the “Westerns”. They sounded so different from the Sulzer and English Electric fare back “home” at the Bridge. It wasn’t just the impressive sound, either. These Maybach powered engines positively sprinted away from the blocks seemingly straight up to full throttle on the various express passenger and parcels workings from the terminus. Fabulous! There followed the usual chasing down of the remaining fleet, and even my father became enthusiastic about them. In the end, we managed to see 33 in service, and I increased this to 35 with D1062 at Swindon on the turntable in 1978, and finally D1010 in preservation down on the West Somerset Railway where she can still be seen working and enjoyed today. In the 1980’s (when I was old enough to help out!) I became a member of the Western Locomotive Association, and gained access to two of the preserved examples, D1013 WESTERN RANGER and D1062 WESTERN COURIER, on the Severn Valley Railway. However, a career in finance and family matters took me away from railways and modelling for many years until summer of 2008 when my interest in modelling was reignited. I happened to glance through a modelling magazine whilst visiting my father who had been busy converting ready to run diesels to P4 scale, and fitting them with soundcards and speakers. The magazine had an article proclaiming DCC controllers and sounds as the next big thing to hit the British railway modelling scene but, turning over the page, there was another article which also caught my eye and depicted the construction of a kit in O Gauge of the Class 44, “Peak”. The photographs were so good that I thought they were of one of the preserved 44’s in Green, but a closer look confirmed it was indeed a model. “Wow!”, I thought, “These kits must be good!” And what’s more, a quick search of the internet showed that they also did a Western! I’d always fancied a good scale model of a Class 52 for my mantelpiece, but until this kit came along I just wasn’t convinced by any of the kits available at that time and, for me, scratch-building wasn’t an option. I found these “new” Just Like The Real Thing kits to be excellent starting points for building a reasonably high quality representation of the various prototypes in their range, and it is a fairly simple task to incorporate such additional features as crews, working fans, directional marker-lights, head-code lighting, cab lighting, etc., and I’ve even seen the more adventurous go for working windscreen wipers – all controlled by the ever improving range of DCC equipment and controllers now available. Well, I became hooked! Having moved on from a ’52 to also build the JLTRT Class 20,25, 26, 37, 40 and 50, I found the mantle-piece just wasn’t big enough, so I looked for somewhere where my new stable could operate. It was here that I was so fortunate to make contact with Phil Spencer and the late Jim Noble who welcomed me into the fold at the Huddersfield Railway Modellers (“HRM”) as a member of the O Gauge section. This gave me access to much more than just the excellent running layouts and facilities, and I can’t emphasis enough the benefits of joining your local modelling clubs to share and call upon the wealth of knowledge and expertise they can offer. It was here that I also met and enjoyed lively discussions over all things DCC with Dave Oliver who shared my interests in sound-fitted O gauge locomotives and who has become a firm friend. Having assisted in the total re-wiring of the HRM club’s main O Gauge running layout, Longroyd Bridge, and then also with the club’s new O Gauge exhibition layout, Lydgate, our thoughts moved to the next display season, and the opportunity lay before us to place two club layouts at a forthcoming show in Halifax. Lydgate was ready to go, and well supported by the steam/analogue boys, so the decision was taken to run Lydgate in steam era and, as Longroyd Bridge was far too large for just Dave and I to transport and operate, we resolved to use the six-week run up to the show to design and build a small DDC demonstration layout which would fulfil our desire to present a worthwhile and entertaining display whilst also meeting the requirements of a demanding show schedule. The following features were foremost in our minds as we formulated our ideas…. Must be capable of being built to an exhibition standard in just six weeks! To utilise the laser-cut MDF viaduct kit developed and kindly donated for this project by Cynric Williams. Sadly, Cynric is no longer with us. He was an inspirational modeller, keen to experiment and to promote his ideas and experiences. Much of his drive and enthusiasm for the hobby is enshrined in the increasingly popular Western Thunder website of which Cynric was a founder member and webmaster, and we sincerely miss his youthful direction and influence. It became apparent that high speed operations with long service trains were out of the question, and so a simple, split level, stabling point was thrashed out on paper with a series of parallel operating lines linked by a few turnouts, and slow moving light engine moves were to be the order of the day. The immediate availability of the pre-cut viaduct was ideal for our purposes, and we took advantage of this as the backdrop which runs the entire 8’6” of the layout. A quick call to ART Printers resulted in the very kind donation of a pair of back-scenes for the project. In the end, we settled on three pairs of turnouts. One pair centrally positioned on the twin running lines on the viaduct itself, and two pairs on the main stabling point to allow light engine moves throughout. Point operation was originally simple solenoids, but these have subsequently been replaced by more reliable Tortoise and Cobalt motors. DCC needed to incorporate at least one wireless handset as the plan was to operate from the front of the layout amongst the viewing public. As we already had access to an ESU controller and handset, this was utilised. There followed a fairly intense few weeks of model-making and, with the benefit of the locomotives being ready to go, our efforts could be concentrated on the layout build throughout. With initial plans on paper, the principal jobs were identified and jobs shared. Dave produced two 4’3” x 1’6” base boards, and I was set on building the MDF viaduct from the parts supplied. Peco track-work and turnouts were taken from stock, and a few days later we had the basic layout constucted. Wiring and fitting of point motors took a little longer than anticipated, but we still had four weeks to come up with the scenic finish. Painting of the viaduct was straightforward using various mixed emulsion sample pots from the local hardware store. Ballast was laid using PVA water which was pipetted onto the dry-laid stone. The track-work was painted using initially an enamel brake dust tone, then tempered using further mixes of emulsion and acrylics. Fencing of two principal types was required to mirror the prototypical fencing of the time observed around Stafford and Norton Bridge. The fence-posts are simple plastic profiles, scratch built and drilled for the nylon fishing line wires to pass through. The meshed fencing was made from veil material purchased from the local market, cut and slightly tensioned using the threaded fishing line wires to keep its shape. This proved quite tricky to do, but the results were quite pleasing. The concrete effect posts were completed by using a stone effect spray paint applied directly to the plastic posts. Rainwater down-pipes were constructed from brass section, and then proprietary signage added. The posters were a bit of fun, and serve to highlight that there were attractions other than just the railways in the long hot summer of ’76. It was perhaps more by good fortune than strict planning that the linear profile of the viaduct worked so well with the use of the mirrors at each end of the layout. This gives the whole layout a much larger “feel”, and has proved an attraction and talking point with the viewing public. Whilst certainly not a new approach, we have been pleased by the resultant effects created. I bit of time was spend developing the idea of the “modern” Ammonium depot area and, in particular, the use of the mirrored half-tank which abuts the rightmost end. Thoughts of further expansion to the Bridge have included a diesel shed, a refuelling point, catenary for expanding to include either AC or DC Electrics and inclines to allow movement between the viaduct and stabling point below. Initial work on the latter is now underway, although we will likely retain the option to operate the Bridge as originally designed and intended, and where the use of the mirrors works so effectively which may be lost on a larger layout. So, if you do see us out and about at your local show then please do Stop, Look, Listen, and also feel free to “have a go”. You never know, it may inspire you to try this improving area of our hobby – or at least take you on a trip down memory lane.